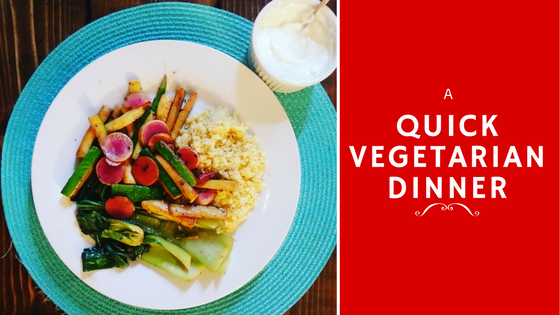 Today I will be sharing a quick vegetarian dinner that travels a little around the globe. You may or may not have noticed the recent switches of the dinners I post on Instagram. Yes, I am now a vegetarian. A vegetarian that is still a foodie and needs all the flavors she can get. And trust me beans can only do so much for you. This Sunday we had a quick dinner and normally how I like to make a dinner for the hubby and I is to keep all the ingredients the same but give him meat. Today’s dinner consists of couscous, zucchini and watermelon radishes, lemon garlic bok choy, and a citrus yogurt sauce to dip in. All my veggies were bought at my local farmers market yesterday! In a bowl combine yogurt, lemon zest, juice of 2 lemon wedges, garlic paste, and olive oil. Season with salt and pepper to taste. Start boiling the water for your couscous according to your packaging. While you are cooking your bok choy the water should begin boiling and you can add you couscous to the water and remove from heat. Add Bok Choy to the pan. Sprinkle with salt. Cook for about 2 minutes (bottom should be turning brown). Flip and cook for another 2 minutes (the bottoms should have begun to soften and green is wilted). Squeeze the juice of the two lemon wedges on top and then transfer to plate. In the pan you cooked your bok choy in, add sliced zucchini and radishes. Cook until soft and season with salt and pepper. Serve and enjoy your amazingly quick but flavorful vegetarian dinner!